Iran’s IRGC has announced the end of its relief operations in earthquake-stricken areas in west of the country. 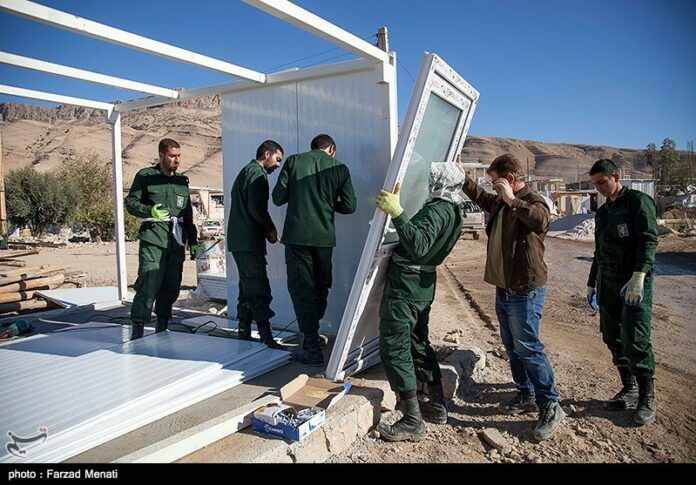 Commander of Iran’s Islamic Revolution Guards Corps (IRGC) Major General Mohammad-Ali Jafari says the IRGC announces the end of its mission in quake-stricken areas in west of the country after having put in place over 8,100 conex boxes there for the quake victims. “After a trip [to the quake-devastated areas] by the Leader [of the Islamic Revolution Ayatollah Seyyed Ali Khamenei], and 40 days on since the day the IRGC committed itself to providing makeshift shelters for the quake victim, now we announce the end of our mission before the 45-day deadline,” said the top commander as quoted by the Persian-language Asr-e Iran website. He said the IRGC had promised to provide 8,000 conex boxes, but put in place over 8,100 ones in the affected areas. The IRGC was tasked with conducting relief operations after a temblor hit western Iran, including Kermanshah province, a few weeks ago. The deadly quake killed over 600 people and wounded thousands of others.